November 19, 2016 By Elizabeth Lindemann 2 Comments / This post may contain affiliate links. GREEK SPAGHETTI. These two words are enough to send my heart (and appetite) aflutter, and have been ever since I was young. Growing up, my mom would make whatever I wanted on my birthday, and more often than not this was my request. It’s the first thing I ever cooked for Zach and now we’re married. (Coincidence? I think not.) I’ve been saving this recipe for a long time, waiting to post on my blog for the right moment. 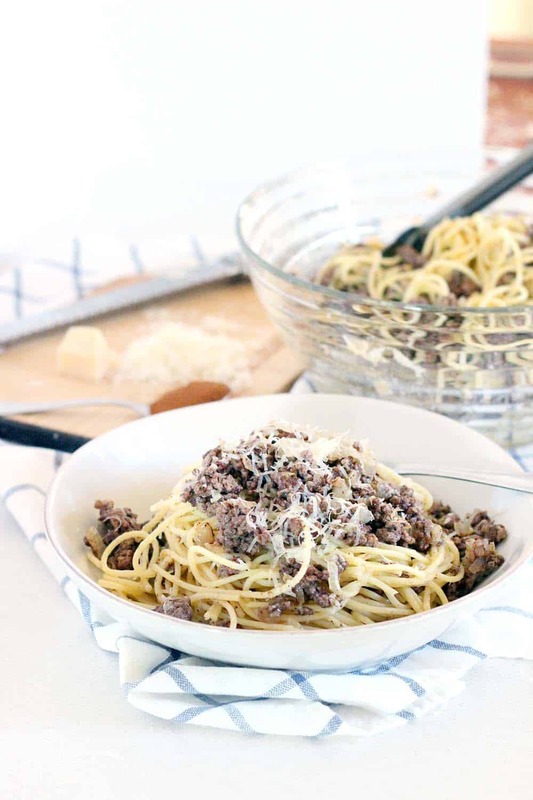 Greek Spaghetti is the ultimate comfort food for me- and given the fact that I am 8 months pregnant and in need of some edible comfort, now seems as good a time as any to share my favorite family recipe with you! Just because this recipe is called “Greek Spaghetti” doesn’t mean it has your most familiar “Greek” ingredients- olives, feta, etc. It’s Greek in an entirely different way. 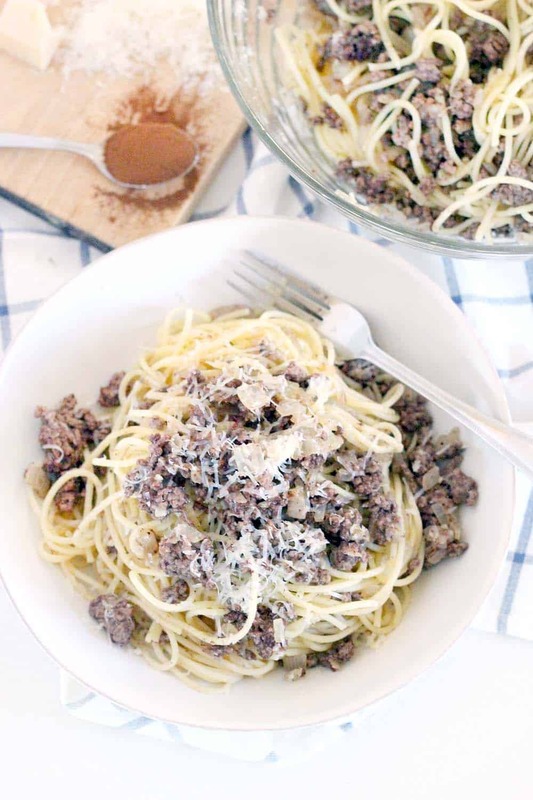 This recipe is packed with ground beef spiced with cinnamon and drizzled with (lots of) rich browned butter, and sprinkled with Romano cheese. It’s rich, earthy, and decadent. And amazing and wonderful and represents everything that is good in the world. It truly is the food of the gods. Using cinnamon in savory dishes is very common in Greek cuisine. Have you ever had Pastitsio (a very common entree served at Greek festivals)? Or perhaps Cincinnati Chili (a cinnamon spiced chili served over spaghetti developed by Greek immigrants in the Cincinnati area)? Both use cinnamon (and sometimes nutmeg) and both are absolutely delicious. I’m writing this post at 8am and just looking at these photographs makes me really, really wish I could dive face-first into a big bowl of this for breakfast. Sigh. Sadly, it’s all gone. It takes only 25 minutes to make and it’s super easy. It has only SIX ingredients! 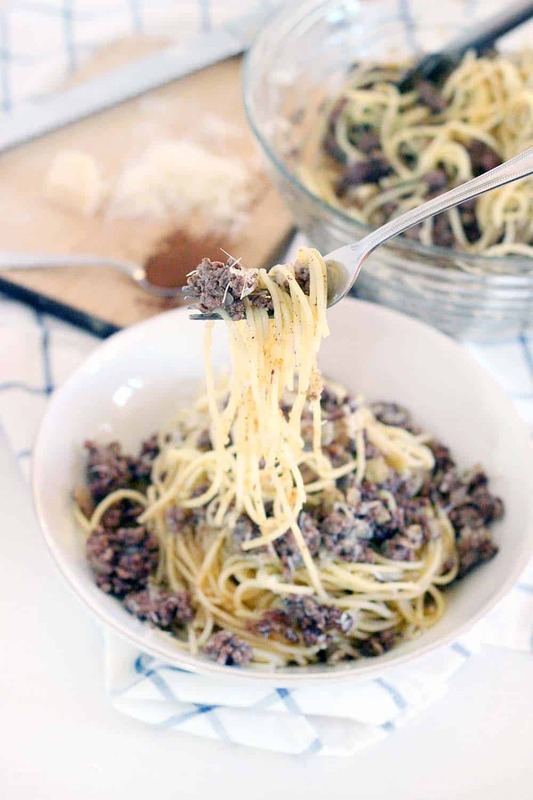 You can easily make it vegetarian by substituting chopped mushrooms for the ground beef. The leftovers reheat very well. Anything made with browned butter is bound to be delicious. 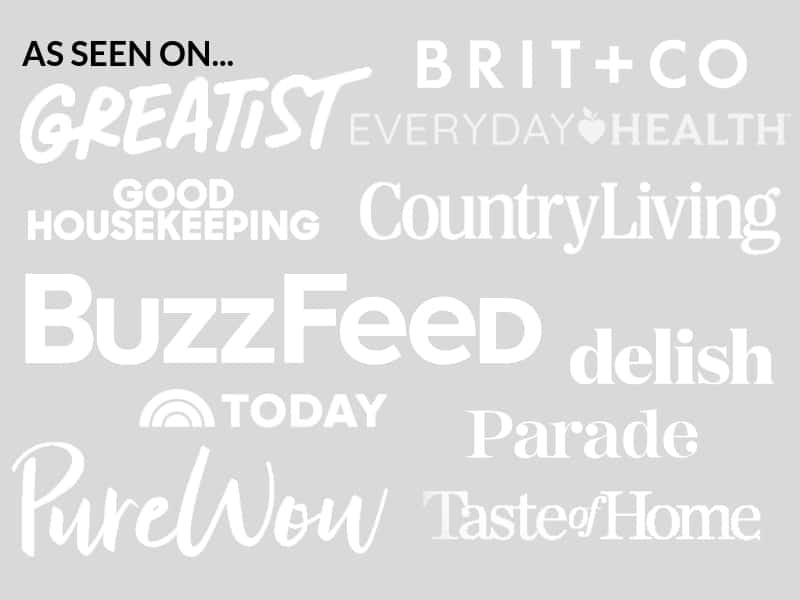 In fact, I have an entire Pinterest board dedicated to recipes that use it. If you’ve never made it before, don’t be sacred- it’s easy. Just melt butter over medium high heat and stir constantly, with a spoon or a whisk, until it foams and turns a light brown color under the foam. The brown color is a result of the dairy solids that are in butter getting toasted. Just don’t heat for too long, or you’ll end up with burned butter! Here’s a good tutorial on how to make browned butter. If you love browned butter as much as I do, try this Spaghetti with Browned Butter and Wilted Greens, this Mushroom Brie Soup, or this Butternut Squash, Browned Butter, and Rosemary Fettucini Alfredo. 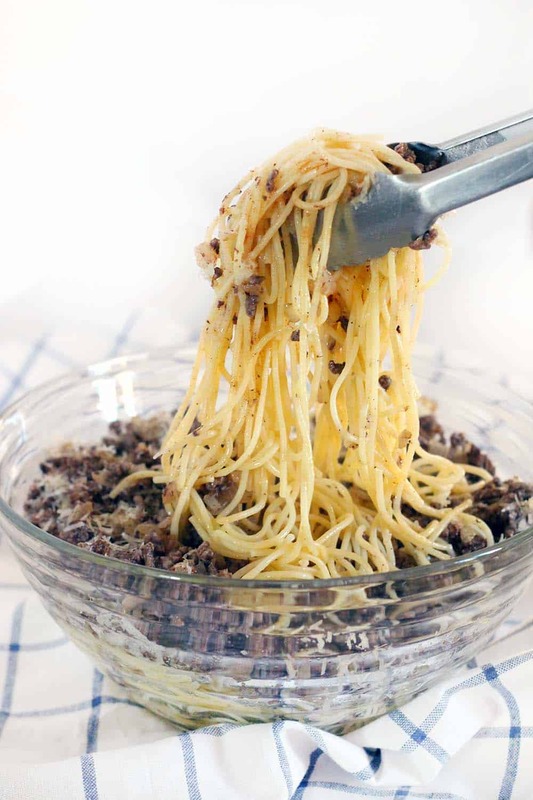 Recipe for Greek Spaghetti below! 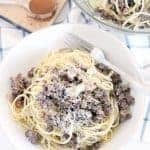 This recipe for Greek Spaghetti has browned beef spiced with cinnamon, is drizzled with earthy browned butter, and is sprinkled with Romano cheese. It's the ULTIMATE Greek comfort food! 1/2 cup Romano or Parmesan cheese, plus more for serving. Cook spaghetti according to directions in salted water. Meanwhile, saute the onion in 1 tablespoon of butter in a large skillet over medium high heat until softened and beginning to brown (about 3 minutes). Add the ground beef; continue cooking until browned and fully cooked. Season with beef and onions with the cinnamon, salt, and pepper. Stir to coat. In a large bowl, layer 1/3 of the spaghetti, 1/3 of the ground beef mixture, and 1/3 of the cheese. Repeat layers two more times. Brown the remaining 7 tablespoons of butter in the same skillet, or a small pot, by melting the butter over medium high heat and stirring or whisking continuously until the butter foams and turns a light brown color underneath the foam. Drizzle the browned butter over the spaghetti. For a vegetarian version, chopped mushrooms can be used in place of the ground beef. Put the noodles in a square dish cover with a lot of finely grated cheese and drizzle with butter. Bake for a few minutes to finish melting the cheese. I’ve only had it with Romano before but I can’t wait to try it with Kasseri! Hopefully I can find it close by. Love the idea of baking the pasta for a little bit- so simple and yummy. Thanks for the suggestion!